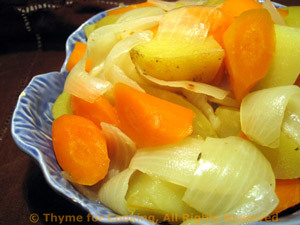 Potatoes, Onions and Carrots, Thyme for Cooking braised in stock. Simple braised vegetables: put them all in a saucepan, add stock, ignore until done. Peel carrots and roll cut: cut the end off of the carrot at an angle, roll carrot 1/4 turn and cut next piece about 3/4 inch away at an angle, roll 1/4 and cut next piece, etc. This gives you interesting looking pieces with lots of surface and helps them cook faster. Cut the potatoes into eighths; the onion into wedges. Put the vegetables into a saucepan, add stock and bring to a boil. Cover and simmer until vegetables are tender, 20 - 25 minutes. Check occasionally to make certain they don't dry out - add more stock or water as needed. Drain if needed, and serve.